Shrimps marinated in a spicy onion paste, coated with semolina and fried until crisp. 1. Add the shrimps to a bowl. 2. Add lemon juice and turmeric powder. 3. Gently toss until the shrimps are evenly coated. 4. Keep aside for 30 minutes. 5. Heat 1 tblsp oil in a heavy pan over medium flame. 6. Add the red chillies, coriander seeds, cumin seeds, fenugreek seeds and mustard seeds. 7. Add little slat and stir well for 30 to 45 seconds. 8. Add the onions and saute for 2 minutes or until golden. 9. Remove, cool and grind to a smooth paste with little water. 10. Add the ground paste to the marinated shrimps and mix well. 11. Keep the shrimps in the fridge for 20 minutes. 12. Mix a little salt with the rava and sprinkle over the shrimps. 14. Heat oil in a deep frying pan over medium flame. 15. Fry the shrimps until golden and crisp. 16. Remove and drain excess oil. 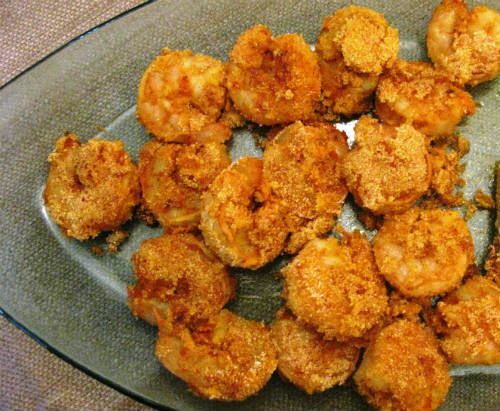 Feel free to comment or share your thoughts on this Karwari Shrimp (Semolina-Crusted Shrimp) Recipe from Awesome Cuisine.